The Tattoo 26, is a trailerable, 26-foot motorsailer built by Paul Sharp and Laura MacGregor Sharp. Laura is the daughter of Roger MacGregor, designer and builder of the MacGregor 26. Tattoo Yachts uses the MacGregor 26 hull and deck molds. Building the Tattoo 26 from established molds means that it is a proven design, and buyers can sail-or motor-their new boats with confidence. 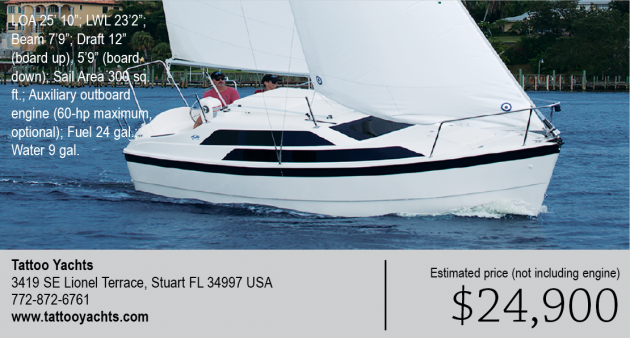 It also means that the Tattoo 26 has some of those renown MacGregor features, such as powerful engine capabilities and water ballasting that make the MacGregor 26 and Tattoo 26 stand out among other small sailboats. There are, however, important differences between the Tattoo 26 and the MacGregor. The Sharps remodeled the boat for the next generation of sailors, who will like the square-topped main, the halyards running aft to the cockpit and other changes, including cosmetic ones. The 6-foot headroom interior is warmer with bamboo trim and a multi-purpose table with built-in storage that also converts into a berth. Topsides, the mast rotates on a hinged step. A roller furler, genoa and an asymmetrical spinnaker are options. Optimizing space with the table and the slide-away galley makes room for an enclosed head, a comfort not always seen on boats this size. The 26 sleeps six in two settee berths, a forward double and a queen-sized aft berth. Some of the extra space comes from the fact that the engine is mounted outboard, and it's an engine that could power a boat three times the displacement of the 26. Ranging from 5 to 60 horsepower, the larger engines push the boat into powerboat performance, in the 20-knot range. Slow down to 6 knots and you can motor for 200 miles without refueling. The 6-foot-long cockpit has winches mounted forward on either side of the companionway. The centerboard control line is lead to the cockpit, and the centerboard itself folds entirely into the hull. That's a protective feature: once the board is up, it's safe from hard landings on sand or the trailer. As a centerboarder, the 26 needs ballast, and instead of lead in the bilge, which would affect trailering performance, the boat uses about 1,700 pounds of water ballast for stability. That's enough ballast to make it self righting. According to the Sharps, it takes about 5 minutes to fill or drain the tanks, and they can be drained while the boat is rolling down the road. As well as the solid stability, an additional safety feature is the hull's foam core, providing enough flotation to keep the boat and crew awash until help arrives. It's more likely the crew will be awash in fun rather than water. The boat's less than 8-foot beam and 2,500-pound dry weight makes it narrow and light enough to trailer to nearly any lake with paved road access, and the 12-inch draft means that it launches off most boat ramps-and then anchors nearly on the beach.